More ‘Hammond sound’ on the KeyB & Nord C2D organs, plus Roland BK-7m. More tracks played on KeyB & Nord C2D organs, plus a Roland BK-7m module. The CD is 99% ‘Hammond sound’ with a few sounds from a Roland BK-7m module, which also supplies the drums (which have been kept in the background). Visit his ORGANAUT YouTube Channel. 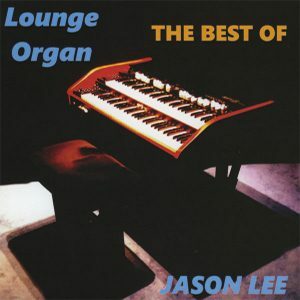 Following the release of my first volume of “The Best of Lounge Organ”, We decided that it was worth another dig through my recordings and continue this series of albums alongside any of my future productions on Tyros. 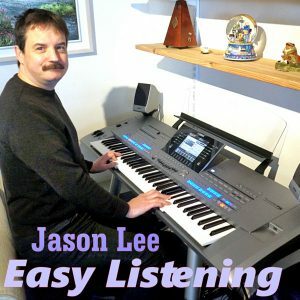 This is actually the 3rd CD release and the previous one titled “Easy Listening” is recommended for those who prefer instrumental tones and so has been recorded on my Yamaha Tyros 5. 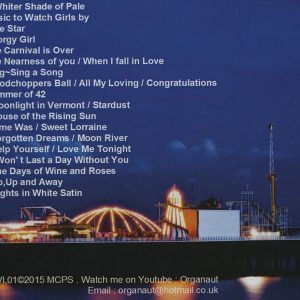 This time I have compiled a selection of tracks which I hope will contain something again for everybody who is a fan of this “old school organ sound of the Hammond type” and, similar to the first “Lounge Organ” CD, features among others; Hits by Andy Williams, Tom Jones, Perry Como, Dave Brubeck, not to mention the likes of “The Monkeys” and the “Doors”. Also included are numbers from the pen of Rodgers & Hart, Woody Herman, Duke Ellington, John Denver and Bob Dylan. Not long after the first release, our friend and very well respected longtime artiste of the organ world John Mann invited us over to his home one evening and during the dinner party kindly put the other guests and myself through the ordeal of having to listen to the copy of Lounge Organ (I gave him as a present) play on his stereo in the background. As a result it would seem that this music is suitable for a laid-back dinner party atmosphere as well as material for the Hammond buff. While some have asked me to describe my musical background, there’s not really much I can say on the subject. I am mostly self taught, having to give up lessons as a child when my father became ill as we couldn’t afford them any longer. Neither do I have musical qualifications other than the ongoing experience of playing at my gigs and public events, including some concerts over the last thirty or so years. I also met Klaus Wunderlich, Alan Haven and other legends who advised me to play my own style, so that is what I mostly try to achieve. 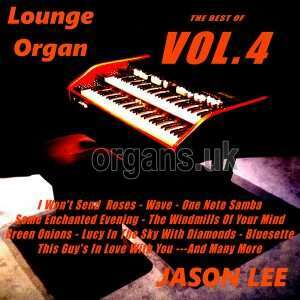 The fourth volume of ‘Hammond sound’ tracks played on KeyB Live organ. The third volume of ‘Hammond sound’ tracks played on KeyB Live. 2016 release, mostly using the orchestral sounds of the Yamaha Tyros 5, with some organ sounds. At the KeyB organ, the CD is 99% ‘Hammond sound’ with a few sounds from a Roland BK-7m. 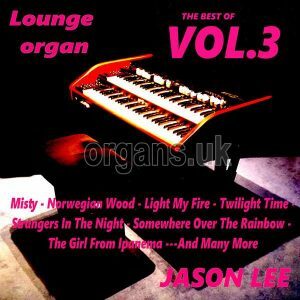 This is the third CD from organist Jason Lee, who many of you may have seen on t’internet under the pseudonym of ‘organaut’ on YouTube. 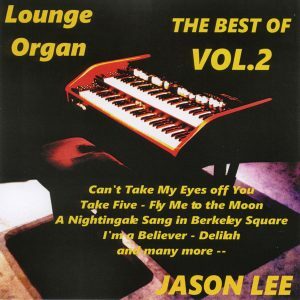 He currently has around sixty videos playing various organs and keyboards including the setup used on this second volume of his “Best Of Lounge Organ” series. This ‘Hammond sound’ is produced on his KeyB & Nord C2D organs (the Nord being added since volume one). There is also a Roland BK-7m module to handle the backings of drums, the odd strumming guitar and occasional lead instrument. 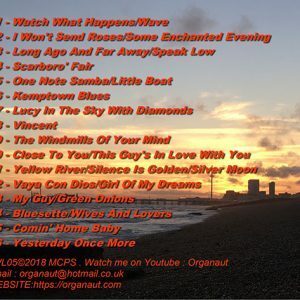 The result is an excellent re-creation and if you love that sound then I think you will like this selection of tunes and the overall sound. Highlights include, “Can’t Take My Eyes Off You,” “Leaving on a Jet Plane,” a lovely solo-organ version of “A Nightingale Sang in Berkeley Square,” a rocky and distorted version of “Black Magic Woman,” “Fly Me to the Moon,” “Early Autumn,” “Girl Talk / Blue Moon” and “It’s Impossible”. FULL TRACKS: Can’t Take My Eyes Off You • Leaving on a Jet Plane • A Nightingale Sang in Berkeley Square / Once in a While • Tie a Yellow Ribbon / Oh Lonesome Me / Snowbird • Fly Me to the Moon • Early Autumn • Delilah • Take Five • I’m a Believer • Girl Talk / Blue Moon • Caravan • I’ll Never Find Another You / Mr. Tambourine Man • It’s Impossible • You Light Up My Life • Black Magic Woman • For All We Know / There’s a Kind of Hush.